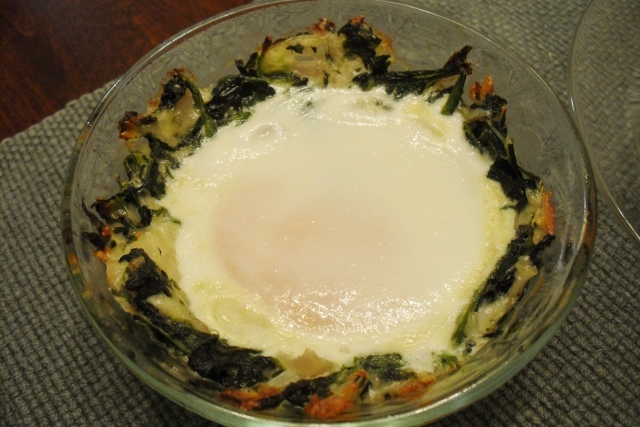 Figure 1 A baked egg in a cream-spinach bed in a 10-ounce ramekin. The recipe and article “Perfect Baked Eggs” by Celeste Rogers (no relation to me that I know of) in Cook’s Illustrated, November/December 2012 is an attempt to demonstrate how to bake an individual egg with a spinach filling (Fig 1). For the most part this is about as good of instructions on how to bake an egg without overcooking it that I have seen. The ingredients are basic ingredients already in the kitchen and freezer. I have looked for a recipe to successfully make little, single egg dishes for years. I have tried several recipes including Scott Peacock’s “Eggs with Cream, Spinach, and Country Ham” in Gourmet, January 2008. Peacock’s “Eggs” recipe should work but never has. I have since traipsed along tinkering with the egg dish every fall and winter looking for something I can use as a contribution to a holiday breakfast. Rogers’ “Perfect Baked Eggs” worked well so that I would not have to tinker with it if all I wanted was a simple egg dish. I will have to jazz it up to make it Christmas Morning material. What I will criticize is the size of casserole recommended for the dish. Rogers recommends “6-ounce ramekins with a 3 ¼-inch diameters, measured from the inner lip.” I think this is to small. I only have 4 6-ounce ramekins and had to use 2 10-ounce ramekins in order to fill out the six servings the recipe made. The difference surprised me (Fig 2). The 10-ounce containers did not overcook the eggs after the 6 minutes in a 425 degree oven followed by the ramekin siting 10 minutes on a wire rack. The eggs in the 6-ounce dish are firm after cooling and will be fine to eat, but with the 10-ounce casseroles the soft egg will nicely mix with the spinach filling. 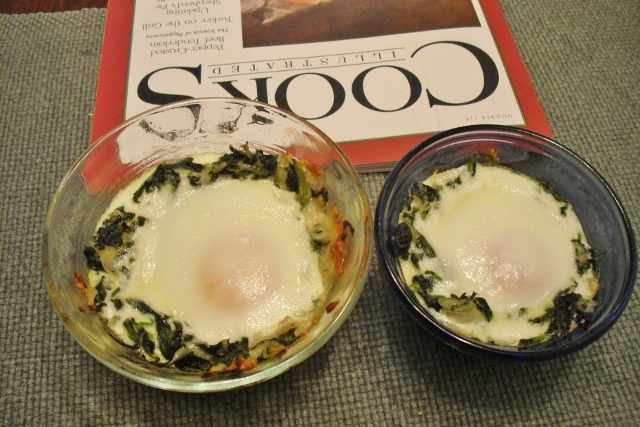 Figure 2 Side-by-side comparison between the baked egg cooked in a 10-ounce ramekin and a 6-ounce ramekin. I recommend the use of Parmesan cheese. It is a dry cheese that will not make the dish greasy or watery like cheddar or any other generic cheeses in the dairy section of the average grocery store. If you can spend the money to purchase the good Italian Parmesan cheese, do that. You will not be disappointed. The oven time Rogers recommends, 6 to 8 minutes at 425 F if using a metal pan to hold the ramekins and 500 F if using a glass backing dish, is to long. The 6-ounce ramekins were overcooked. Temperatures are correct, I think. Since the demise of Gourmet I have had to look to Cook’s Illustrated for good recipes. I have noticed Cook’s Illustrated recipes tend to recommend times that will overcook the dish. I have wondered if this is an effort to make sure the food is fully cooked, even when the writer and recipe recommend checking the internal temperature. This is a recipe where, in order to prevent overcooking you will be standing or kneeling in front of the open oven door watching the eggs cook until the egg whites are just full white. I will make the “Perfect Baked Egg” recipe again. I will also tinker with it. What I have found with these egg casseroles is 5-ounce spinach and 5-ounce finely chopped “woodsy”-tasting mushroom is good. What I like is adding, per ramekin, a half slice home-smoked bacon, frozen firm then sliced into 1/8-inch slivers with kitchen shears, then fried with grease discarded (bacon grease does not add anything good to the taste of the egg casserole no matter how fresh the smoked bacon is so stick with Rogers’ 2 tablespoons butter to cook the shallot in at the beginning) and two large, cooked shrimp, frozen firm then sliced into less-than ¼-inch pieces added to the spinach/mushroom/shallot/half-and-half/Parmesan mixture. Recipe and demonstration video can be found at the Cook’s Illustrated website if you are a online member by searching for “baked egg” . I served the baked egg with French Onion Soup (Gourmet magazine recipe), milk, and for dessert Chocolate Pudding Cake.